Opera vocalist Matthew Polenzani, right, teaches a vocal master class to one of four selected NU vocalists. This was Polenzani’s second time teaching at Northwestern, and said he chose to return because of the high caliber of students he worked with last year. Opera vocalist Matthew Polenzani returned to Northwestern to teach his second vocal master class with four students on Wednesday. 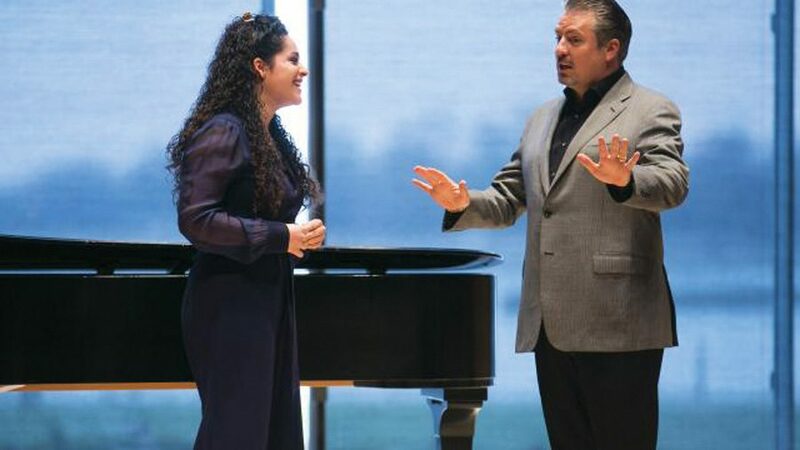 The master class was part of the Robert M. and Maya L. Tichio Vocal Master Class Series, a series of master classes by noted vocalists for Northwestern students, said Kurt Hansen, coordinator of the voice and opera program. The program is in its third year and is funded by an anonymous donor to the Bienen School Music Advisory Board who named the class series in honor of the Tichios, two of his friends and fellow board members. All voice students are required to watch the classes, which are open to the public and typically draw a crowd of around 300 people to the Mary B. Galvin Recital Hall, said Jerry Tietz, director of concert management. Polenzani majored in Music Education at Eastern Illinois University, originally intending to be a high school choral instructor. He said his vocal career launched after a former member of the show choir he was part of at the time heard him singing at a performance with the choir and encouraged him to consider singing professionally. Now an award-winning singer, Polenzani has appeared on stages across the United States and Europe including Lyric Opera Chicago, San Francisco Opera, Paris Opera and Carnegie Hall, among others. He was also awarded the 2004 Richard Tucker Award and Metropolitan Opera’s 2008 Beverly Sills Artist Award. Polenzani has been teaching master classes for the past six or seven years. He said it was an “easy decision” to come back to teach a second NU master class because he was impressed by the caliber of students that he worked last year. In addition to his career, Polenzani encouraged aspiring vocalists to lead a well-rounded life and attributed his singing success to maintaining his personal life. “You’ll be able to sing much more deeply about love and about loss … and all the themes that we find in opera with a lot more knowledge and a lot more heart when you’re out there experiencing those things for yourself,” Polenzani said. Tietz said Polenzani is “one of the most highly-sought tenors in the planet” and said his class last year was quite successful. The master class series typically holds three or four classes a year, bringing in professional vocalists from around the world and featuring several Northwestern upperclassmen and graduate students who are selected for the class by NU’s voice faculty, Hansen said. Each of the singers gets about 20 minutes to perform and work with the master teacher and a general open forum with the audience which typically follows, Hansen said. Polenzani is currently singing at Lyric Opera of Chicago’s production of “The Magic Flute,” and Tietz said because he is still actively singing and performing, Polenzani can speak in “a very immediate sense” about the industry and his own life experiences.